The digital revolution has brought with it a new way of thinking about manufacturing and operations. Emerging challenges associated with logistics and energy costs are influencing global production and associated distribution decisions. Significant advances in technology, including big data and analytics, AI, Internet of Things, robotics and additive manufacturing, are shifting the capabilities and value proposition of global manufacturing. In response, manufacturing and operations require a digital renovation: the value chain must be redesigned and retooled and the workforce retrained. Total delivered cost must be analyzed to determine the best places to locate sources of supply, manufacturing and assembly operations around the world. In other words we need a digital transformation. 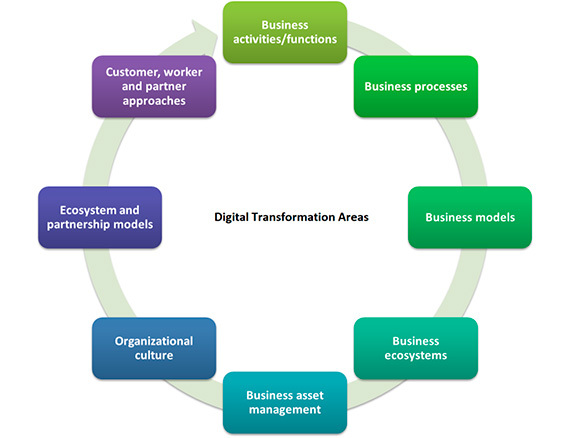 Digital transformation (#DX) is the profound transformation of business and organizational activities, processes, competencies and models to fully leverage the changes and opportunities of a mix of digital technologies and their accelerating impact across society in a strategic and prioritized way, with present and future shifts in mind. A digital transformation journey needs a staged approach with a clear road-map, involving a variety of stakeholders, beyond silos and internal/external limitations. This road-map takes into account that end goals will continue to move as digital transformation de facto is an ongoing journey, as is change and digital innovation. IoT is sometimes referred to as the driver of the fourth Industrial Revolution (Industry 4.0) by industry insiders and has triggered technological changes that span a wide range of fields. Gartner forecasted there would be 20.8 billion connected things in use worldwide by 2020. IoT developments bring exciting opportunities to make our personal lives easier as well as improving efficiency, productivity, and safety for many businesses. More than 50% of companies think IoT is strategic, and one in four believes it is transformational. Both increase company longevity. The average company’s lifespan has decreased from 67 years in the 1920s to 15 years today. One in three industry leaders will be digitally disrupted by 2018. Both enable businesses to connect with customers and partners in open digital ecosystems, to share digital insights, collaborate on solutions, and share in the value created. Competitors are doing it. According to IDC, 70 % of global discrete manufacturers will offer connected products by 2019. Enterprises are overwhelmed by data and digital assets. They already struggle to manage the data and digital assets they have, and IoT will expand them exponentially. They need help finding the insights in the vast stream of data and manage digital assets. Both drive consumption. Digital services easily prove their own worth. Bundle products with digital services and content to make it easy for customers to consume them. Both make companies understand customers better. Use integrated channels, big data, predictive analytics, and machine learning to uncover, predict, and meet customer needs, increasing loyalty and revenues, IoT and AI are at the heart of this. Using both is future-proof the business. Make the right strategic bets for the company, product and service portfolio, and future investments using IoT data analytics, visualization, and #AI. Digital transformation is a complicated challenge, but the integration of blockchain and AI makes it much easier. Considering the number of partners (internal, external, or both) involved in any given business process, a system in which a multitude of electronic parties can securely communicate, collaborate, and transact without human intervention is highly agile and efficient. Enterprises that embrace this transformation will be able to provide a better user experience, a more consistent workflow, more streamlined operations and value-added services, as well as gain competitive advantage and differentiation. Blockchain can holistically manage steps and relationships where participants will share the same data source, such as financial relationships and transactions connected to each step, security and accountability is factored in, as well as compliance with government regulations along with internal rules and processes. The result is consistency, reductions in costs and time delays, improved quality, and reduced risks. AI can help companies learn in ways that accelerate innovation, and assists companies getting closer to customers and improve employee’s productivity and engagement. Digital transformation efforts can be improved with that information. 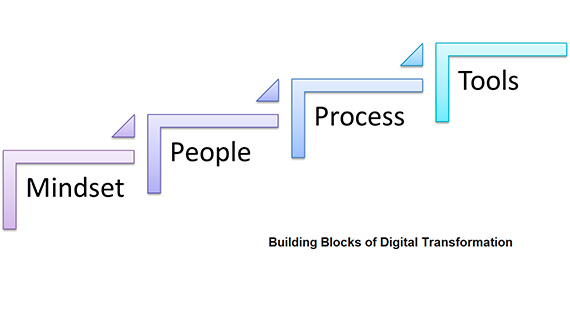 The building blocks of digital transformation are; mindset, people, process, and tools. IoT covers all the blocks since IoT doesn’t just connect devices, it connects people too. Blockchain will ensure end-to-end security and by using AI you will move IoT beyond connections to intelligence. One important step is to team up with the best partners and invest in education, training and certifying your teams. This magical mix of IoT, AI and blockchain will help make transformation digital and easy.